In a recent effort Dr. Max Popp, Dr. Hauke Schmidt and Prof. Jochem Marotzke, scientists at the Max Planck Institute for Meteorology, have published two pioneering studies about how clouds may behave in hot climates and how clouds may affect the long-term habitability of Earth and similar planets. Planets experience large variations in forcing over their lifetime due to changes in the solar luminosity, changes in orbit and changes in atmospheric greenhouse-gas concentrations. These variations occur on time-scales of thousands to billions of years and can change fundamentally the climate of planets. For Earth-like planets that are largely covered by an ocean of liquid water, this means that a temperate present-day Earth-like climate is unlikely to persist indefinitely. During periods of strong negative forcing Earth is threatened to cool to a point of becoming fully ice-covered (3). During periods of strong positive forcing the oceans could completely evaporate ― a process known as the Runaway Greenhouse. Stellar theory predicts that the luminosity of a star increases with time and therefore the probability that an Earth-like planet may end up in a Runaway Greenhouse increases. This leads to two questions concerning our solar system. First, may Earth end up in a Runaway Greenhouse in the far future? Second, may Venus have had a similar climate as Earth billions of years back when our sun was less luminous? Venus may have gone through a Runaway Greenhouse and may then have lost its water. So it is crucial to understand how an increase in solar luminosity could lead to a Runaway Greenhouse, in order to assess the long-term habitability of an Earth-like planet. We assume here that a planet is habitable if a liquid ocean is stable at the surface, which is a widely used definition. The classical Runaway Greenhouse results from a competition between two counteracting consequences of rising surface temperatures. On the one hand, higher temperatures cause the planet to emit more thermal radiation, which stabilizes the climate. On the other hand, higher temperatures cause an increase in atmospheric water vapor, which through the enhanced greenhouse effect causes the planet to retain more radiation and thus destabilizes the climate. If the latter effect wins, the total radiation to space levels off despite rising surface temperatures, and a Runaway Greenhouse occurs. Simulations with atmospheric column models have found that the emission of an Earth-like planet would level off at a threshold at surface temperatures of around 80 to 130° C. A Runaway Greenhouse would thus occur if the solar radiation increases to a level where the planet absorbs more solar radiation than this emission threshold. The planet would keep warming until all oceans are completely evaporated. Note that in contrast to solar radiation, greenhouse gases are thought to be ineffective at initiating a Runaway Greenhouse, because they do not alter the emission threshold. Past studies have used strong simplifications of clouds or neglected clouds altogether. Popp and colleagues' study (1) is the first to focus on the influence of clouds on the initiation of a Runaway Greenhouse. The results of (1) suggest that clouds have the potential to substantially raise the threshold for insolation to start a Runaway Greenhouse. Clouds influence the climate by reflecting solar radiation, which cools the climate, and by retaining emitted radiation, which warms the climate. Popp and colleagues showed in (1) that the effect of the clouds on the solar radiation has a very strong influence on the initiation of a Runaway Greenhouse that can be substantially larger than the influence by the water vapor feedback (Figure 1). This influence of the clouds allows for interesting phenomena, such as the climate becoming unstable for a temperature range of 25 °C to 65 °C, a regime of stable hot climates at surface temperatures above 60 °C, and a range of solar luminosities for which two different climates are possible. Study (1) also provides an explanation of why clouds should have a strongly stabilizing effect in warm climates: There is an emission threshold for clouds as there is for water vapor. Once this emission threshold is attained, any thickening of the clouds will no longer lead to an enhanced greenhouse effect but will only reflect more solar radiation and thus cool the climate. Because the clouds become thicker in warm and moist climates with increasing surface temperature, clouds then stabilize the climate. Figure 1: Synthesis of the emitted thermal radiation and of the absorbed solar radiation as a function of a planet's surface temperature (ST).The left panel shows the results when clouds are transparent to radiation and the right panel shows the results when clouds interact with radiation. Gray stars denote model results of the emitted thermal radiation and red circles model results of the absorbed solar radiation from transient simulations. The black and the red lines are manual fits to the results. 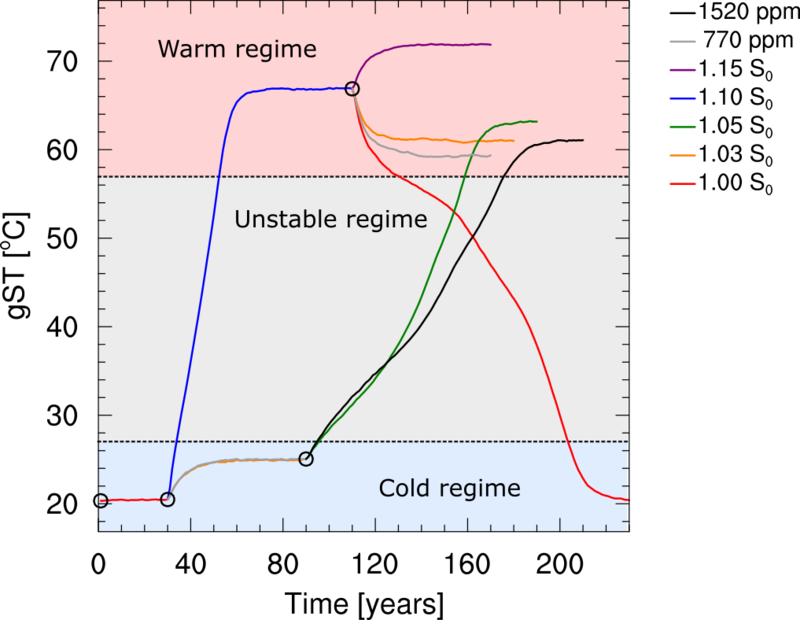 The climate becomes unstable at ST higher than the red squares, because the difference between the absorbed and the emitted radiation increases with increasing surface temperature. If the clouds are turned on, the difference increases because of the absorbed solar radiation. By contrast, when the clouds are turned off, the difference increases because of the emitted thermal radiation. In the simulations with clouds, steady states can be attained again at around 380 K where the red and the black line intersect again. The atmospheric column model used in (1) has, however, a few shortcomings. An atmospheric column model approximates the climate of a planet by averaging the atmosphere into a single one-dimensional column. Such models can be very useful, especially for the conceptual understanding of certain processes, but they cannot represent the large-scale atmospheric circulation. In the specific case of an increase in solar radiation, there is especially one potentially important mechanism that the column model cannot capture: The large-scale motions in the tropical troposphere are the main mechanism by which water vapor is mixed upward into higher levels of the atmosphere. An adequate representation of water vapor in the upper levels of the atmosphere is important, because planets can lose water to space. Water molecules are broken by the ultra-violet radiation from the sun into hydrogen and oxygen in the upper levels of the atmosphere. The hydrogen, being much lighter than the oxygen, can then escape to space. This effect is also taking place on present-day Earth, but the rate at which hydrogen is lost is too low to lead to a substantial loss of water. However, if the water vapor concentrations in the upper atmosphere were around 100 times higher, Earth could lose all of its oceans to space within its lifetime and even faster for still higher concentrations. With almost no water left, Earth would eventually become uninhabitable. Hence, the loss of water to space due to a moist upper atmosphere is a second way, besides the Runaway Greenhouse, by which an Earth-like planet could lose its habitability. A climate in which a planet loses water to space at a fast rate is called a Moist Greenhouse. The column model used in (1) was not able to mix water sufficiently well into the upper levels of the atmosphere, to simulate Moist Greenhouse states adequately. Therefore, Popp and colleagues performed a second study (2) with a three-dimensional atmospheric model in which they investigate the potential of solar forcing to cause a climate transition to a Moist Greenhouse. Moreover, study (2) also investigates increased CO2 concentrations to compare whether CO2 has a similar effect as solar forcing. CO2 was previously thought to be ineffective in bringing about uninhabitable conditions, but clouds could change this notion as the results from (1) suggest. This subsequent study (2) indeed suggests that CO2-induced forcing poses an equal threat to the habitability of an Earth-like planet as does solar forcing. The state in which Earth is now, could be terminated in the far future by any of the two types of forcing causing a climate transition to a new stable climate in the Moist Greenhouse regime with global-mean surface temperatures exceeding 60° C (Figure 2). This transition is caused by changes in cloud dynamics that first destabilize the climate, but then help stabilize the climate again at global-mean surface temperatures above 55° C. These changes in cloud dynamics are caused to a major extent by a weakening of the large-scale atmospheric circulation. The Moist-Greenhouse climate is very stable against further forcing, mostly because of a negative cloud feedback, which suggests that a planet could maintain this climate for a very long time. Moreover the results even suggest that if the initial forcing that caused the planet to go into a Moist Greenhouse is removed, the planet may still remain in a Moist Greenhouse. As previously mentioned, a planet in a Moist Greenhouse would be subject to a "rapid" loss of water that would render a planet uninhabitable over a period of hundreds of millions to a few billion years. Thus CO2-induced forcing could eventually put an end to a planet's habitability. Figure 2: Global-mean surface temperature (gST) as a function of time. Circles denote states from which simulations are started. The different colors indicate the different applied forcings. Chromatic colors denote solar forcing which is given as multiples of the present-day solar irradiance on Earth (S0). For all these simulations the CO2 concentrations are held fixed at present-day Earth values. Hence the red lines correspond to present-day Earth solar and CO2 forcings. The achromatic colors show the simulations with CO2 forcing given by the volume mixing ratio. Note that CO2 concentrations of 770ppmv yield an equivalent forcing to 1.03 S0 and CO2 concentrations of 1520ppmv yield an equivalent forcing to 1.05 S0. The plots show that for both a CO2 concentration of 1520ppmv and a solar forcing of 1.05 S0 a climate transition occurs from the cold to the warm regime. But when starting from the warm regime a reduction of the forcing to 770ppmv or 1.03 S0 does not lead to a transition back to the cold state. This indicates that two different steady states are possible for this magnitude of forcing. The solar radiation Venus received in the early days was so much larger than the solar radiation necessary to send a planet into a Moist Greenhouse in our study that it appears highly unlikely that Venus could ever have maintained an Earth-like climate. However, whether Venus, provided it had an Earth-like atmospheric composition, would have been able to maintain a liquid ocean of water in a Moist Greenhouse, could not be established by the studies. The results have important implications for the evaluation of the potential habitability of planets discovered around other stars. There are several missions looking at other stars for planets, hundreds of planets have already been discovered, and potentially habitable planets are expected to be discovered in the next years. The Moist Greenhouse sets a minimum distance from a star at which a planet could maintain liquid water and thus could still be habitable over its lifetime. Moreover, by showing that greenhouse-gas forcing is as efficient in causing a transition to a Moist Greenhouse as is an increase in solar forcing, we show that the habitability does not only depend on the distance of a planet from a star, but also on the atmospheric greenhouse concentrations. As a consequence, detailed knowledge of the atmospheric composition of planets around other stars is necessary to assess their habitability. Knowing only the position and size of such a planet is insufficient. Clouds play a major role in shaping the long-term climate evolution of Earth-like planets, and changes in clouds with increasing surface temperature dominate the response to large forcings - irrespective of the type of forcing. Therefore, deepening the understanding of the behavior of clouds in hot climates is a crucial step toward obtaining a better understanding of the warm limit of habitability of Earth-like planets. Knowing only the position and size of a planet is insufficient to assess its habitability; knowledge of its atmospheric composition is also required.